In 1914, cinema was already very popular all over Scotland. Almost every small town had its own cinema and Glasgow had almost a hundred! At the time, most cinemas did not show long films like today, but rather a programme made up of several shorter silent films, with music provided by a pianist or an orchestra. The programme would include different types of films, such as comedies, adventure stories, travelogues, and newsreels. 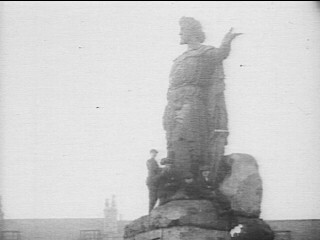 This resource introduces short films made in Scotland around the time of the First World War. 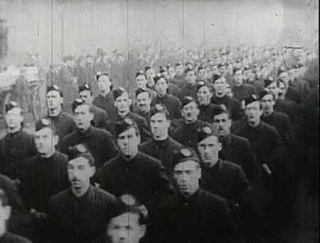 Note for teachers: This lesson has been created to accompany the Learning Resource 'Cinema and the First World War in Scotland' (see below PDFs). The resource consists of two publications: teachers' notes and student worksheets. The resource connects with different areas of the Curriculum for Excellence, with particular relevance to the History National 5 unit on The Era of the Great War, 1910 – 1928. Additional material suitable for the New Higher History unit on Scottish Study: The Impact of the Great War, 1914 – 28 is also provided. Watch the film and take notes: what do you see? What do you think is happening? Write down any questions you have about the film. Think about the film as a historical 'source'. To answer the questions below you will need to consider a) the origin and possible purpose of the source, b) the content of the source, and c) your own knowledge. The film was made for screening at the De Luxe Cinemas in Rothesay (Bute) and Glasgow by cinema owner Randall Burnette. It was produced in 1914, just before war was declared. How useful is this film as evidence of ordinary peoples’ reactions to an imminent war? What does the film suggest about Scotland on the eve of the Great War? This film clip shows territorial soldiers preparing, training and parading at Hawick. What emotions are people displaying? Are they happy or sad? What is the general mood of this film? What activities are the troops doing in preparation for war? Make a list. What flags can you see and what do you think they represent? Make a list. This film clip shows Boy Scouts learning the skills of a soldier. Think about what may have happened in the lives of the children in the years following the film. Develop a ‘mind movie’ of one of the Boy Scouts in the film. Tell your mind movie to your neighbour or create a story board to illustrate the key scenes. 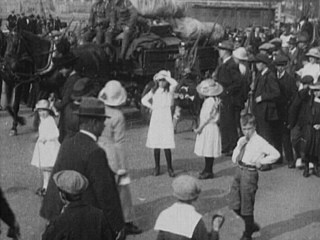 This clip features a First World War recruiting march by soldiers of the Chamber of Commerce Battalion. Watch the clip then read the background information below. Members of Glasgow Chamber of Commerce were eager to contribute and so, as part of the rapid expansion of the regular army, a battalion was formed. On 3 September 1914, following a unanimous decision by the Chamber leadership, the 17th Highland Light Infantry (Glasgow Chamber of Commerce Battalion) came into being. Recruitment took place in Merchants’ House and the 17th Battalion was quickly established. 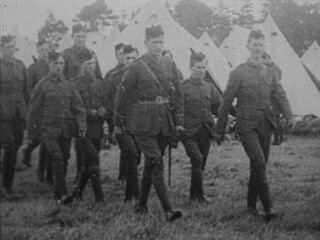 Towards the end of 1914 – right through to the summer of 1915 – the Battalion trained at both Gailes and Troon in Ayrshire before embarking on further training in England. On 22 November 1915, training was completed and the Battalion departed for the Port of Havre in France. The Battalion quickly settled into the routine of the trenches where they endured a “hard and monotonous” winter. As the war drew on the Battalion, like many others, was present at the disastrous Battle of the Somme in July 1916. At the Battalion parade for Roll Call on 4 July, casualties totalled 22 officers and 447 from other ranks.The Battalion was disbanded in early 1918 after a decision by the War Office and its colours were laid in Glasgow Cathedral. Who do we see in this film? What ages? What social classes? Are they all going to war? Why do you think a film of The Glasgow Chamber of Commerce Battalion was made? What does the film tell us about the classes of people that volunteered for the war? Please refer to the Cinema and the First World War worksheet if you would like to do an activity comparing source materials. Imagine that you and your friends have all enlisted in the army in 1914, just like the men in the Chamber of Commerce. Your class would be a Pals’ Battalion and would undergo training. Give the class a battalion name. This may be the first time you have been out of your local area and visited another town! Respond to the questions on page 6 of the worksheet using your own using words, pictures and/or colour to express your emotion. Take one minute for each question. This film depicts daily life in one of fourteen field hospitals set up by the National Union of Women's Suffrage Societies in European theatres of war, entirely staffed by women. 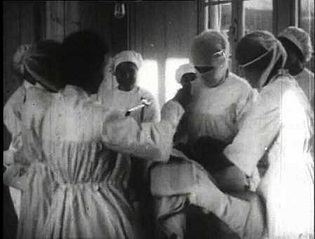 The organisation was founded by the prominent Edinburgh physician Elsie Inglis (though she does not feature in this film). The footage was filmed on the front line at Villers-Cotterets and in Salonika. 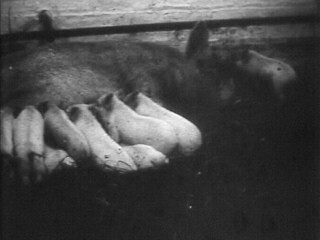 It is likely the operation featured in the film was 'staged' for the camera. Evaluate the usefulness of the film as evidence of the impact of the war on Scottish women and of women's work. How fully does the film show field hospitals in World War One? This film was produced just a few months before the war ended.It shows "Julian the Tank Bank" in Edinburgh, Dundee and Aberdeen raising money for the war effort. What evidence can you see in the film that many wanted the war to end? Why would the government parade a tank through Scottish cities as a 'Tank Bank'? What impact might this gesture have on the Home Front? Why was this film made? What was the purpose of the film? What is the significance of the last written slide (intertitle) in the film? In pairs, produce a mind map of words, phrases and stories the dignitaries might use to persuade the people of Scotland to donate money to the war effort. Choose one of the dignitaries. Make up a short (one minute) speech that could be spoken over the film. Critically analyse the film - which elements are opinions and which are facts? Is it easy to tell them apart? Why was the film made? What information does the film give about women and the work they did during the First World War? What is the overall message of this film? How does the film use humour? How does the film depict life in the trenches? How fully does the film show the impact of the war on Scottish society? There are some other films from the First World War period on Scotland on Screen which you may be interested in discussing. Links to these, and all of the films mentioned in the resource, are through the records at the bottom of the page. You can explore Scotland's story of the war through the experiences of individual Scots by visiting the National Library of Scotland's website Experiences of the Great War. The website includes resources for schools. This lesson guide was prepared by history teacher Alison Gillen with researchers from the University of Glasgow. Created November 2014.